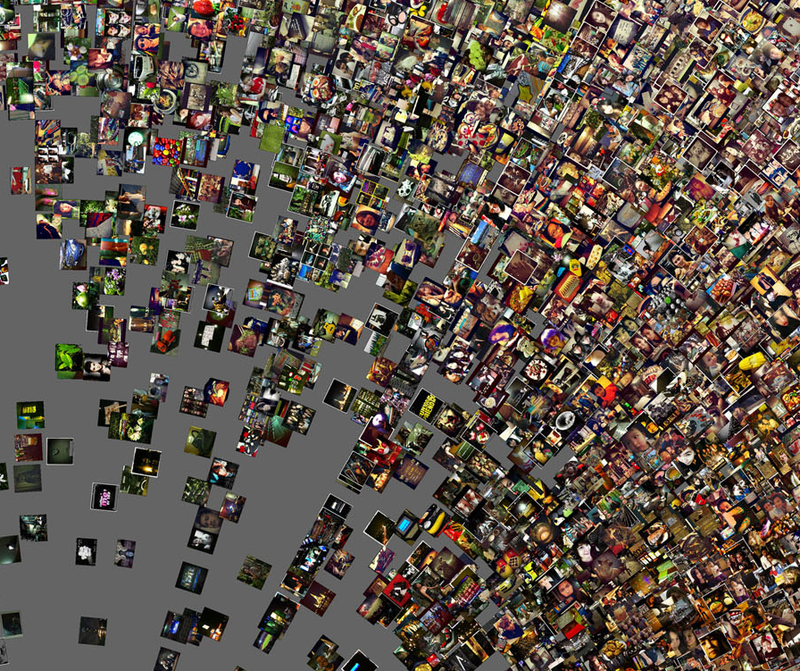 Detail of visualization of 53,498 photos shared in Tokyo taken between 18 and 25 February 2012. Photos are sorted by upload date and time (top to bottom, left to right). Click here for a full size high resolution image. 50,000 Instagram photos from New York City, organized by brightness mean (perimeter) and hue mean (radius). Detail. Click here for a full size high resolution image. 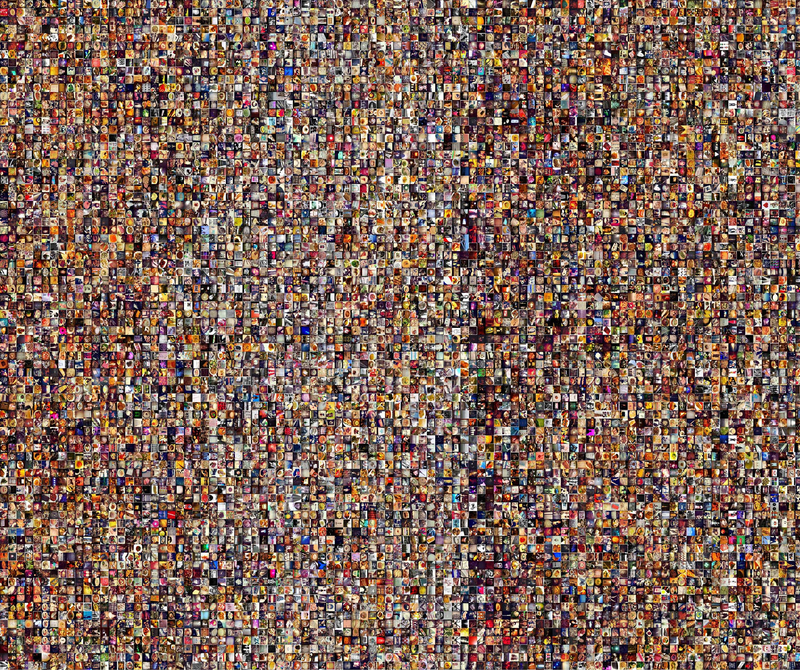 50,000 Instagram photos from Bangkok, organized by hue median (perimeter) and brightness mean (radius). Detail. Click here for a full size high resolution image. Nadav Hochman, Lev Manovich, and Jay Chow. Nadav Hochman and Lev Manovich. Zooming into an Instagram City: Reading the local through social media. Feature article, First Monday, July 2013. What do millions of Instagram photographs tell us about the world? 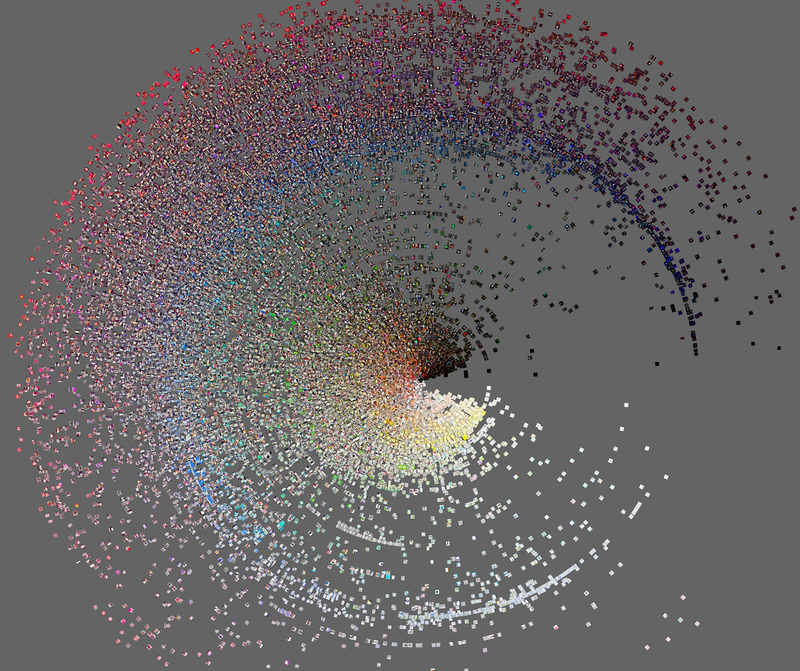 How can we see larger cultural patterns contained in such massive visual social data? Do these images reflect the specificity of local places? A group of researchers from the Art History department at the University of Pittsburgh, the Software Studies Initiative at California Institute for Telecommunication and Information and the Computer Science program at The Graduate Center, City University of New York collaborated to investigate these questions. The result is Phototrails, a new research project by Lev Manovich, Nadav Hochman, and Jay Chow. Their research is the first academic study to investigate Instagram’s big visual data.The project developed new visualization techniques to analyze and compare more than 2.3 million publicly shared Instagram photos from 13 cities such as New York, San Francisco, London, and Tokyo. The team’s findings are published in the July 2013 issue of First Monday (http://www.firstmonday.org), an open-access peer–reviewed journal. In addition, all visualizations and findings are available on the project’s web site at http://phototrails.info/. The researchers found that each city has its own unique visual signature on Instagram. Based on measurements of multiple visual attributes such as hue, brightness, line orientation etc., Bangkok was found to be the most visually different from other cities, followed by Singapore, and Tokyo. “Our visualizations allow us to uncover the aggregated visual characteristics of each city as well as to examine the impact of exceptional events such as hurricane Sandy”, says Nadav Hochman, a Ph.D. student in the History of Art and Architecture department at the University of Pittsburgh. The study also looked at the patterns of Instagram use among 312,694 people during a four-month time period. The great majority of people only uploaded one or a few photos. The proportions of these active users vary significantly from city to city. For example, the percentages of people who uploaded more than 30 photos are 2% in NYC, 6.7% in Moscow, and 10.9% in Tel Aviv. The researchers also found differences in the use of Instagram filters. In their sample, the proportion of photos to which Instagram users applied filters varies between 68 and 81 percent. The cities with the highest percentage of filtered photos are Tel Aviv, London, and San Francisco, while the city with lowest percentage is New York. The project is a collaboration between Nadav Hochman (PhD student, History of Art and Architecture, University of Pittsburgh), Lev Manovich (Professor at The Graduate Center, CUNY, Visiting Researcher @ Calit2, and Director of Software Studies Initiative), and Jay Chow (graduate of the Interdisciplinary Computing and the Arts undergraduate program at UCSD, and Researcher @ Software Studies Initiative). The project is supported by The Andrew W. Mellon Foundation. The Cloud Library, Volume 1, photo+sphere exhibition, Asheville, North Carolina, November 7 – 11, 2018. Historia irracional de un conjunto de medida nula, curated by Cristina Figueroa, Centro de Desarrollo de las Artes Visuales, Havana, Cuba, October 14 - November 10, 2016. GLOBALE: Infosphere, curated by Peter Weibel, ZKM | Karlsruhe, Germany, September 5, 2015 – January 31, 2016. The 2nd Annual Filmatic Festival, UC San Diego, La Jolla, April 30 - May 2, 2015. Google Zeitgeist 2014 conference, Paradise Valley, Arizona, September 14 - 16, 2014. "The Aggregate Eye: 13 cities / 312,694 people / 2,353,017 photos", curated by Hyewon Yi and Alise Tifentale, the Amelie A. Wallace Gallery, SUNY College at Old Westbury, New York, October 29 – December 5, 2013.